Schachenmayr Original Multicolor. The mixture of 8 different colors in many fresh, trendy colorways makes this yarn truly special. 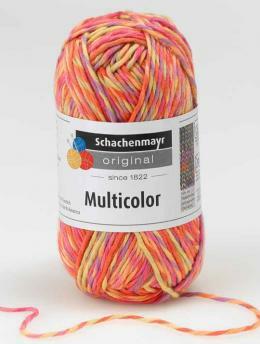 Only pure cotton was used to make Schachenmayr original Multicolor, in order to achieve the bright, brilliant colors which show to full advantage in both the ball and the finished knit object. Of course, in the addition to the color advantages, this yarn also offers the good wearing and care properties of cotton. Formerly SMC Multicolor.